I think I may be to crafty for myself! 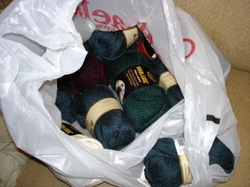 So today the paper came and Michaels's was having a big yarn sale..Everything was 25-50% off. 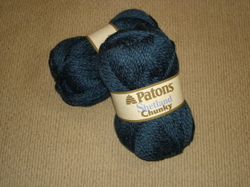 So I went and I bought this: It's a really pretty really deep teal, Paton's Shetland Chunky. I've used this yarn before for my Anthropology inspired caplet. I didn't want to spend to much on the yarn for this project since it is kind of trendy (though super cute) I thought it would be good for Juliet sweater. Then I check out Ravelry. And several people are using this yarn for their Juliets too. So anyway...I think I want to do long sleeves for it. So do you think I should do the sleeves in garter stitch, like the tree jacket, or lace on the sleeves..sort of like Robin did on her tree jacket...What do you think? I say lace on your long sleeves!! YAH! I like the lace idea, too... has anyone else done this with long sleeves that you can look at and get ideas from? and more importantly - is that sale at michaels still going on? I say lace - I am really happy with mine!